Look for the city to have a new sausage supply once Dustin Merrett of Windy City fine-tunes his links for market. 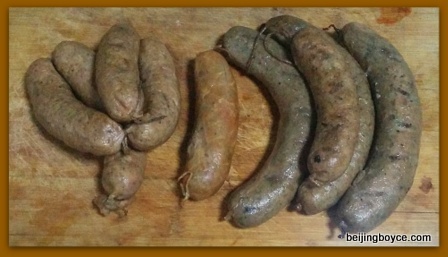 Merrett gave me some samples on Friday: the photo above shows, from left to right, rabbit followed by spicy beef followed by pork with sage and dried apple, the latter used as a natural sweetener. You might wonder why there is only one spicy beef sausage. Because Merrett was short? Nah, because I already ate the rest. I’ve been testing them out in a variety of ways, from grilling them straight up in my cast iron fry pan, to mincing them with garlic, chili peppers, onion and tomato and spreading it on crackers, to adding them to scrambled eggs and noodle dishes for some extra punch. Merrett says customer response has been good at Windy City. I generally like them, especially as the casings aren’t as rubbery as with some sausages, though the pork links are a bit soft. Anyway, I will give a few to friends to get their reactions and will update once these links are for sale beyond Windy City. Which reminds me I also need to post about my two visits there. 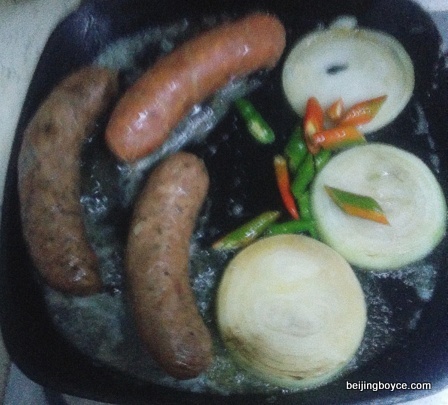 Finally, here’s a really blurry photo of all three kinds of sausages sizzling in butter in my frying pan. I blame the steam.